Bulova His Excellency is correct, but the pink gold variant might have been given a different variant. I'm looking to see if I can find any reference. The 'DD' variant had lugs that were straight, without the subtle curve this case's lugs have. This case is more in line with the SS variant; rose gold was the 'TT' variant, but dial configuration is different. Definitely not the DD, I'm tentative on the TT as well. Gents where did the "TT" variant come from? Agreed the lugs differ from the "DD" .Softer lines without the angles on sides. I question "TT" due to dial difference. "SS" (yellow) had a fully numbered dial. It would be assumed that "TT" (red) had the same dial as "SS" due to being described as a "SS" available in Red" in the ads. Subject watch is even numbers only like the "DD". In photos it appears to be yellow gold. If that is the case, it has had the dial refinished. Numbers appear to be silver? MGD001, can you verify is the dial brown, copper or black? Are the numbers on dial gold or silver colored? Is casing yellow or red (pink) gold? It's a 1947 His Excellency, but I hesitate to commit to a variant. 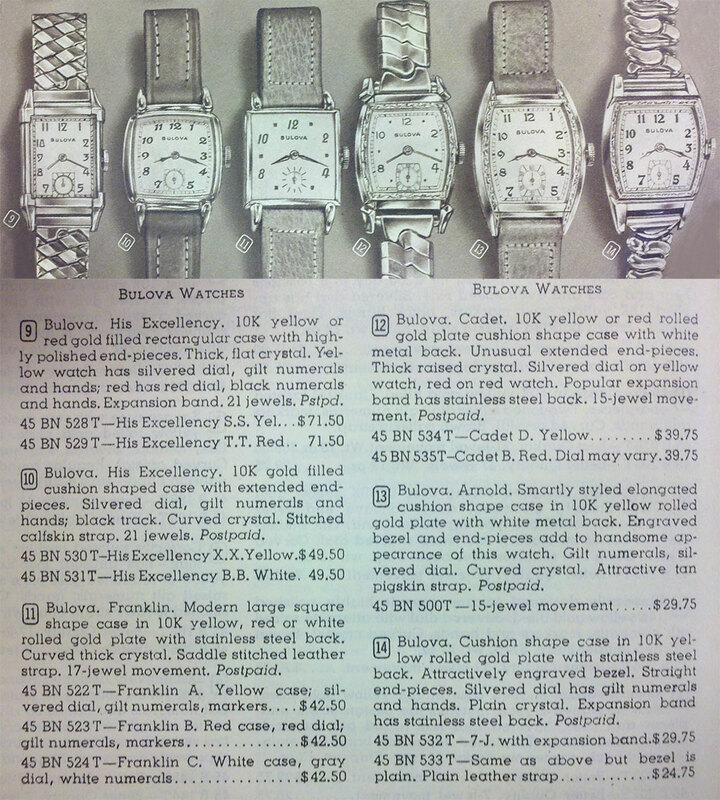 It doesn't seem to match any in the Db or ads besides one example with a lighter colored dial in the generic HE group. These are in natural light. It looks to me as the case is yellow gold, the face is faded red or brownish, the numbers are silver and the hands are either blue or black, the second hand looks faded. I hope these pictures help to identify it better for you. Based on the new photos and info, my gut feeling is that it's a marriage of parts with a refinished non-Bulova colored dial; It appears that there is a tiny bit of "overspray" on the inside edge of the "8". Dial may be original Bulova color (but should be paired with a rose gold case.) The vast majority of gold cased watches have gold dial markers. I'm puzzled by this one. Nothing negative, it's a cool watch and an attractive job, however ID'ing it as a Bulova model is tough. I may be wrong, but think this one falls into the non-conforming catagory. It could be a yet to be identified variant, but colors don't seem to match the Bulova norm. Wear it and enjoy it. Panel can we get a final tally on this one? Case is yellow, so "TT" seems unlikely. 1947 HE no variant noting dial replacement or refinish ; or non-conforming (potential marriage).